Chevy television spots featuring voiceovers from Michigan-native actor Tim Allen will air tonight when the San Francisco Giants host the Texas Rangers at 8 p.m. on Fox. DETROIT -- Spending for General Motors Co.'s new Chevy advertising blitz that starts tonight during the World Series is expected to top the $685 million the brand spent in all of 2008, GM marketing boss Joel Ewanick said today. The major beneficiary of surge in post-bankruptcy marketing spending will be GM's agency of record for the Chevy brand, San Francisco-based Goodby, Silverstein & Partners, the Omnicom Group-owned firm that replaced agency Campbell-Ewald after 91 years in April. Goodby -- best known for its “Got Milk” campaign -- is opening a Detrot office just a few blocks from GM world headquarters. About 120 to 130 people eventually will work there, a mixture of local hires and people brought in from elsewhere, agency co-founder Jeff Goodby said. The campaign, which employs the slogan “Chevy Runs Deep” and the brand's iconic bowtie logo, emphasizes the Chevrolet's long history while touting new technology and safety. “We will not be successful unless we talk about that,” he said. 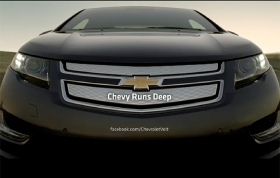 One commercial features the Chevy Volt, finishing with the moniker, "Chevy Runs Deep." Ewanick, GM's vice president for marketing, Goodby and others previewed the spots for reporters this morning at Goodby's Detroit offices. The entire campaign is Goodby's work. The creative work is primarily being handled in San Francisco, but it will transition to 50-50 with Detroit as the local office fills out, Goodby said. “I don't want this to be San Francisco junior,” he said, adding that the office is making local pitches for non-Chevy work. More Chevy work will drop in November for holidays and college bowl games leading up to the Super Bowl. About 40 percent of the Chevy ad spending will be on television commercials, with the remainder split on print, radio, digital, outdoor and other marketing channels. The increase in spending is something of a force-multiplier for the automaker and its agencies because in 2008 there were eight brands compared to just four today -- Chevy, Buick, Cadillac and GMC. “There's enough money for us to go out and compete,” Ewanick said. Campbell-Ewald, which is trimming some of its 1,200-person staff in the wake of the Chevy loss, continues to handle GM's customer relationship marketing, OnStar, Chevy local market area dealer work as well as transitional Chevy brand work through the end of December, the agency said. Last year, as GM was reconstituting itself after federal aid and bankruptcy, it opened its Chevy work to other agencies, and Malibu, Equinox and Traverse were moved to the U.S. offices of Paris-based rival advertising holding company Publicis Groupe SA, which owns Publicis Worldwide. GM then initially shifted Chevy to Publicis in April, but Ewanick moved the account to Goodby shortly after he was hired. He did marketing work for Ewanick when the latter was running marketing at Hyundai Motor America. They had lunch and Ewanick told Goodby he was interested in the GM position and that he would give the brand work to the agency if he got the position -- which he did in May. “Every time he called me, he said, ‘You know you're going to get Chevy, so be ready,'” Goodby said.